The contrasts of Italy can be striking. Nerve-jangling cities, pressed close and gesticulatory. Pastoral, ambered countryside as much Etruscan as modern Italian. Verdant beauty, industrial squalor, living history, the fleeting whims of modern fashion. But always, always, always overlaid with the intensity of the Italians themselves. Hands in flight, mach 5 language in simultaneous eruption, pressing any and every point until it has been flattened or pierced, and never, ever yielding. Faster and more intense there, more restrained here…the regional and cultural differences show…but if there’s any sort of national unity in this dubiously unified country, it’s this. And it’s so here in the Piedmont, too. Parts of it almost impossibly beautiful, reclining peacefully amongst vine-covered hills. Wines both royal and common, as richly conceived a cuisine as one will find. History. And, it must be noted, wealth, which does not always factor into the Italian equation. Every predicate, it would seem, to a peaceful, self-satisfied existence. But illusions are no less illusory for their patina of gentility. No face can hide roiling passions forever, and those passions are what define this tenuous national culture. The Piemontese may be slower to it, at least outwardly, but eventually it will out. All the argumentative, confrontational glory of those passions, unleashed. Perhaps first on targets external…but then, inevitably, turned inward. Not just because there’s disagreement and discord – though of course there is – but because no one is better at passionately-engaged disorder than the Italians. Why waste time bickering with lesser practitioners? 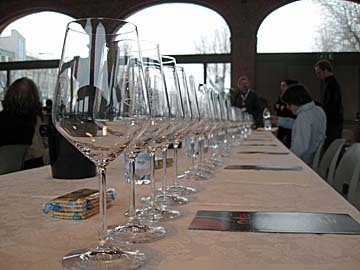 We’re in the Foro Boario in Nizza Monferrato for yet another – another? yes, another! – tasting. More Nizza-labeled wine, more pressing of an organoleptic point that seems increasingly elusive in the glass, but ever clearer when viewed cynically. That cynicism is, admittedly, helped along by the fact that this is a (beautifully) refurbished cattle market. Well, the cattle have arrived. Let the slaughter begin. Outside, it’s snowing. 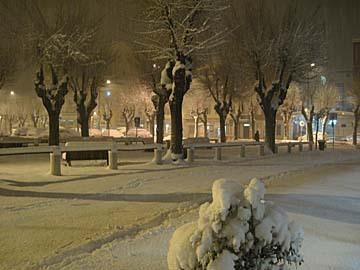 A fluffy, blanketing snow. The din of the city is muffled. Peace descends. Piedmont is quieting. Inside, amongst the cattle? Not so much. After the tasting, there’s a speech. A long one, chockablock with grand statements of intent. Not unexpected, of course, but after a lunchtime speech that was drier but had actual oenological research to report, something that’s purely marketing-driven may contribute to pushing the cattle’s tasters’ moods into the reddish hues. 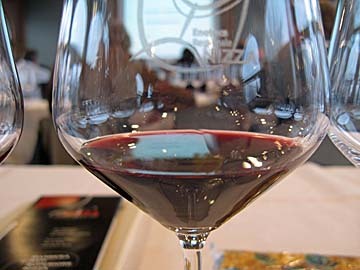 There’s material – and perhaps it’s intentionally vague, but at any rate it’s unsatisfactory when paired with the organoleptic evidence we’ve just finished expectorating – justifying the existence of the Nizza sub-appellation, and a fair amount of satisfaction expressed at the style and quality of what we’re tasting. This is a little odd, to be honest. It wouldn’t be had the day gone differently up to this point; one hardly expects that the producers, here to promote their product, would be anything other than enthusiastic. But immediately after a largely hostile post-lunch Q&A in which the clear dissatisfaction of some of the assembled has been communicated, a bland reassertion of the party line might be heard in a different context. Could that be a note of defensiveness that we hear? No? Well…why not? These are producers who were pretty harshly attacked, earlier in the day, and though most of them weren’t physically present at that event, the news has to have been communicated by now. Where’s the counter-argument? Where’s the preemptive defense? Where’s the passion? Yet all this is still mere prelude. And had we moved directly from tasting and post-tasting speech to dinner, this post wouldn’t exist. As at lunch, the actual controversy-catalyzing event may be a more basic one: opening the floor to questions. Matters start pleasantly enough. Here’s a Danish audient, well-pleased and happy to report same. “To be honest, I didn’t used to like barbera, but now it’s a truly interesting wine, and now I enjoy it.” To this there is some nodding from the producers, perhaps even a faint smile here and there, but far from universal approval. This is revealing because it betrays a clear and pervading sense that if some agree with this sentiment, some do not, or at least are on the fence about it. Or, maybe, it’s that they found the old wines unsatisfactory for reasons other than personal taste. Could that be? Near the end of the just-mentioned speech, we are treated to a fairly passionate defense of the current wines. What’s strange is that it comes not from the producers, but from a writer for Gambero Rosso. Not, it must be added, an unbiased source when it comes to championing the tools of internationalization, as their triplicate bicchieri have long-demonstrated. Moreover, it’s a very odd synergy of effort, like a Pentagon official handing the microphone to an allegedly disinterested reporter and asking her to defend a military decision. Shouldn’t there be some separation between the two camps? Is it really Gambero Rosso’s job to promote the wines of Nizza? And then, the fun begins. Several things should be noted in advance. One is that much of what follows (though not all of it) is translated. Translation is a hard enough job to begin with, but translating heat – both directions – has to be draining. It is, as always, possible that certain nuances and senses have been lost in that translation. It is also worth mentioning that as tensions escalated, the translator’s tone took on a decidedly aggrieved tenor, at times seeming to do so without prompting; the clear sense was that the translator herself was getting her back up, for reasons that weren’t entirely clear. This is fully understandable, given the tenor of the room, but it may have contributed to an escalation of tensions…adding a second layer of upset when, before translation, there may have been only one. Another is that what follows is not all from the Q&A in Nizza. At times – and it will become obvious why – it seemed necessary to include words from other times and places. Those intrusions have been clearly noted, but it’s worth mentioning to head off potential confusion. The first volley of contrarianism comes from an Italian attendee, apparently not on board with Gambero Rosso’s enthusiasm. The Nizza wines, he says, are “very structured but lose drinkability,” and in fact are “so structured it’s hard to drink [them].” He then suggests that they’re more like Amarone than barbera. It’s an on-point charge, especially as we’ve already visited a producer who uses an appassimento-like procedure, but the concentration and density of these wines is, I think, coming mostly from the more usual methods. Now, I’ve noted before that, sometimes, the answers to questions asked of winemakers here (and elsewhere) can be confusing and contradictory. If I may presume to divine intent, I don’t think it’s usually because the producers don’t know what they’re talking about, or that they’re lying but not very good at it. Either is possible, of course, but I’m hesitant to jump immediately to the worst possible interpretation when more charitable alternatives exist. I think, instead, that the producers are themselves sometimes conflicted on these issues. Or if they’re not, they’re cognizant of debate with their peers over controversial matters; they “hear” this internal narrative of dissent and uncertainty while they’re trying to express a coherent philosophy. Not necessarily trained as public speakers, and sometimes attempting these formulations in languages other than their own, consistency can fall by the wayside. And there’s no blame in that. But there’s also no answer in that. For example, one producer’s response to this initial challenge is that alcohol “is a problem with these wines,” but that producers are “trending towards” making more elegant wine. But then, he changes his mind. “I don’t see higher alcohol as being a problem.” (This is the same person speaking, remember.) He then finishes with a reiteration that “we do need to go towards more elegance.” So: alcohol isn’t a problem, but we’re trying for more elegance because it is a problem. Got it. OK, so maybe there’s at least some agreement, from some quarters, that these Nizza wines have been muscled up a little too much, and that maybe their alcohols contribute to a sense of mass that doesn’t serve them well. But then, the answer moves to address another structural complaint, this one regarding a lack of acidity in these modern barberas. Note that the charge is neither refuted nor challenged; assent is inherent in this response. But that’s not what strikes me about the answer. What does hearkens back to Kermit Lynch’s brilliant Adventures on the Wine Route. In it, there’s an encounter (I may get some of the details wrong; this is from memory) in which a producer defends his decision to start aggressively filtering based on potential new markets in places like Africa. 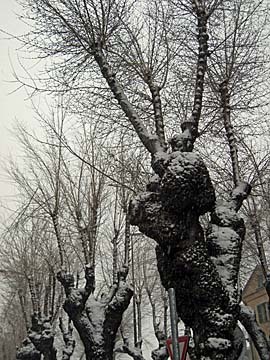 The reasoning is that these far-flung locales couldn’t handle the immeasurable shock of sediment (or worse, instability if the wine is treated poorly in transit), and thus the entire world must be subject to the shipping conditions and theoretical naïveté of one new – and probably very small – market. Those familiar with Lynch’s position on filtration can probably guess his opinion of this defense. And so, here is the suggestion that if no one knows barbera used to be a high-acid wine, no one will miss the acidity. Well, maybe that’s true for these mysterious new markets (though I think pretty much anyone can guess who’s being talked about), but it’s a little insulting to everyone else. If, next year, barbera is sold to us as a sweet white wine because someone in Bhutan doesn’t know that it was ever otherwise, are we supposed to embrace that as well? Is no one listening to Professor Vincenzo Gerbi, the university researcher who presented our lunchtime lecture? The fun – the real fun (by which, of course, I mean red-faced confrontation and controversy) – starts with the ever-cantankerous Belgians. No, really. That’s the end of this, then? It’s just a simple divergence of opinion, right? Well, wait. 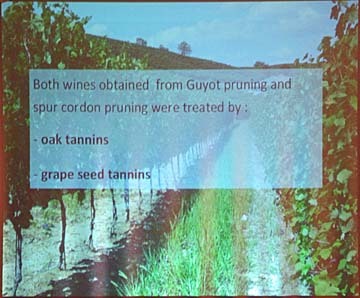 Here’s a slide (pictured at right) from this afternoon’s Hastae presentation, backgrounding the wines that were produced to determine and demonstrate differences between pruning methods. 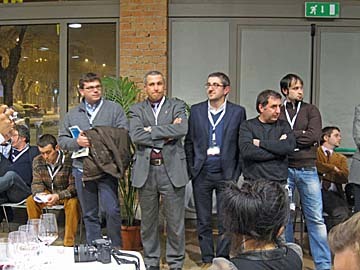 The Hastae organization, remember, is suhbeaded by the names of its founding producers: Berta, Braida, Chiarlo, Coppo, Prunotto, and Vietti. So unless these are absentee directors…and they can’t all be, since Michele Chiarlo was most definitely present while this slide was being projected a few feet behind him…they are almost certainly aware what was done to the wines. So here’s my follow-up question: does Lodovico Isolabella have any concept of what his peers are doing? Do they have any idea what they are talking about? Maybe he should direct his ire at them. So who’s craving these woody barberas? I suspect most readers suspect who’s going to receive the blame, eventually, but the journey to and around that point is intriguing. That seems like an odd thing to say when one is near-simultaneously moved to tout the extreme popularity of wood in one’s export markets. If one really isn’t crafting wine for the market, then the proper answer is some variation on “I make wine the way I want to make wine.” Whether or not it’s true, the needs of marketing are served and it’s difficult to gainsay. Now, let’s go back to that earlier discussion regarding acidity, and why we’re told its diminution in these wines isn’t a problem. The markets being referred to can’t be Europe, because these wines have long been available there. And it can’t be the U.S., either, because they’re no strangers on our shores, either. Looking around the room at the attendees and the regions they represent, or just employing simple common sense, it’s clear who’s meant: Asia. It’s the Asians who, according to these producers, don’t care about barbera that lacks its signature acidity. It’s not important to know, at this stage, whether or not this contention is true. It might be, and it might not. Asia’s an awfully big market. What’s important is that a market and its preferences have been identified. And now, over another issue, we have more geographical subdivision: successful European markets like Germany, Switzerland, and Belgium apparently prefer unwooded barbera. (To this one could likely add Scandinavia and much of the rest of Northern Europe.) And the Americans are believed to want fruit and wood. So…are we sure no one is making wine for the market? Maybe it’s as simple as the fact that our anonymous owner is (and admits same) and that Michele Chiarlo isn’t. But there seems to be an awful lot of identification of market preferences going on, that by pure coincidence happens to coincide with a massive upsurge in new oak (and a concomitant downgrade of acidity), resulting in wines that by pure coincidence happen to serve the perceived preferences of those markets. Me, I’m a firm believer in coincidence. But not appellation-wide coincidence. I have a question, though. Are the producers of barbera right? Are fruity, woody wines what the Yanks crave? Not so fast, objects Charles Scicolone, who is becoming somewhat of a professional Asti antagonist today. He has a problem with the idea that Americans like oaky wines; in fact, he counters, Americans are turning away from oak. “I’m tired,” he insists, “of hearing ‘we made this wine for the American market.’” He’s tired of tasting allegedly American-style wines at producers around the world, wines so heavily-barriqued that they’re “not the wines that locals want to drink.” He then gestures towards the row of bloggers of which I’m a part (six sevenths of whom are Americans) and points out that we’re obviously examples of Americans who do not, in fact, like big, fruity, oaky wines…and have been rather stridently saying so. Scicolone is right, but it’s worth bringing some nuance to this issue to clarify the bounded sphere in which he is right. “Americans” is an awfully big, Hydratic market with a lot of different preferences. If the American market in question is the one that buys the lower echelons of the Constellation Brands portfolio (.pdf) and its Australian/Chilean/Argentinean/South African/etc. counterparts in supermarkets and corner liquor marts, then yes…that American market probably does want fruit-forward, oaky wines. But those are also inexpensive wines. The barberas that live that price realm are not fruit-forward, oaky wines. They’re the steel or old-wood versions in all their traditionally lean, razored sharpness. In other words, the “classic” barbera that we’re alleged to not want. And this cannot really be otherwise, because new wood and other heft-inducing techniques in the vineyard and the cellar are expensive. Pricing that’s competitive with mass-produced, industrial wines is unlikely at best. No, these wines carry a higher cost…in some cases, significantly so. As such, they are attempting to capture the interest of an entirely different market. One with a much greater diversity of options from pretty much everywhere in the world, and one that can afford to make stylistic choices based on that diversity. This market has fragmented, and anyone who was actually familiar with it would be quick to say so. Yes, there are those who prefer fruit and oak. But there are also those who crave fruit without oak, and those who prize elegance and austerity, and those whose preferences are more philosophical than organoleptic. There are lovers of high-acid wines and those that find acid shrill. There are embracers of conformity and adventurers after diversity. There is, in other words, no one market. What, then, is the pitch to be made for these wines? For it is no easy task to grasp and hold the attention of consumers who have as many choices as any wine lover throughout history has ever had. And it’s even more difficult when working with somewhat-unfamiliar grapes from previously-unknown places…like, say, barbera from Nizza. If the pitch is the singular character of barbera, which those who know the wines’ history will expect and seekers of difference will require, then a deluge of wines that have been reconceptualized in an anonymously international style will be eminently ignorable. And if the pitch is that fruit-forward and oaky style, then what’s the compelling reason for a lover of such wines to divert funds from any of the dozens (hundreds?) of wine regions already making exactly this kind of wine? What does barbera from Nizza (or anywhere in the Piedmont) have to offer that’s unique? The “American market” that loves and wants these wines exists, I’m afraid, only in theory. It may have existed fifteen or twenty years ago, and the Piemontese might have captured it then with the work they’re doing now. Or it might come back again; wine trends can, of course, sometimes be cyclical. But right now, absolutely the last thing one should be doing to attract a cash-strapped, ever-more-fragmented American market is to be making wine-a-likes in a style that is already fading from majority favor. All this unsolicited (and, let’s be honest, potentially wrongheaded) strategic marketing advice aside, I’m less certain than the winemakers we’ve heard from that Americans and their quercal tastes are really to blame. I think the entire foundation of the decision to remake wines in this fashion comes from something else: an obsession with importance. Or, to write it in the reverent terms with which it is regularly employed by winemaker after winemaker here, IMPORTANCE. Were it only so, Signore Chiarlo. Were it only so. as someone in Neive once told me, the color of money guides the evolution of taste. Speaking to The Wine Mule's comment, I think that that the Barolo-inspired inferiority is in part true. But I also think we need to consider how Barolo and Barbaresco eclipsed a centuries-old tradition of Barbera (particularly Barbera del Monferrato), a legacy which once enjoyed international acclaim and now is largely forgotten. Hoke: it made my head hurt, too. But then we had dinner and drank, and it was all better. Mule: that's part of it, yeah. But they're also listening to the wrong voices…both external and in their heads. 2B: …and in any case, the Monferratos were by a fair margin the "best" collection we tasted. Not necessarily the best when compared with the best single bottles from elsewhere (at Brovia, for example), but certainly the least reflective of misguided aims.